Since studying Spanish intermittently throughout my life, I've picked up enough basic phrases and words to get by in most Spanish-speaking countries. But when visiting Costa Rica this past winter in the heart of Central America, I suddenly found myself speechless. As I quickly learned, the Spanish they speak in Costa Rica is slightly different than that in other Spanish-speaking countries. 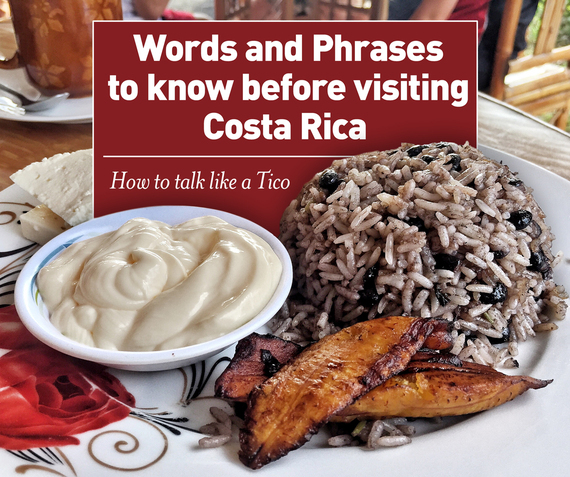 Ticos -- A Tico (or Tica) is, simply, a Costa Rican. Postres -- Meaning, sweet: McDonald's sundaes, candies, cookies, cakes. Costa Ricans are addicted to sweet flavors. If you wonder why this country was chosen as "the happiest place on Earth" some years ago, that's your answer. They’re all high on sugar. Birra -- Like the Italian word, it means beer. Costa Rica has a surprisingly amount of good craft beers and locals are frequently happy to share. The cheap birra of choice throughout Costa Rica is Imperial, but I suggest going for the craft beers instead. Birra is best with pollo frito. Yummy! Casado -- Casado is Costa Rica’s unofficial national dish, most often served with a variety of rice, beans, picadillo, tortilla, cheese and a type of meat (frequently chicken or beef but also fish, especially in the coastal zones). Hora Tica -- Translation: late. When you’re expecting a taxi to arrive in two minutes and it arrives twenty minutes later, that’s what Costa Ricans will call, la hora tica. You have to deal with it; clocks mean nothing here. Chimichurri -- Something like pico de gallo, according to some of my Costa Rican friends. Other Costa Ricans will say that it’s nothing like pico de gallo. The truth remains to be discovered. Let's just say it’s a small salad served as a side dish. Música plancha -- Literally translated as “iron music,” it refers to Latin American songs in which the men are the evil traitors abusing women, cheating on them and deserting them. Música plancha is the music that a sad woman might sing while ironing her abusive husband’s clothes. Some gay clubs in San José play this music, including a popular gay night at the hipster bar and café El 13. Check their Facebook page for the Planchatón nights. Mae -- It’s the Spanish tío, the German Kumpel, the English dude. It means friend, but you’ll also use it with strangers and to express surprise. Everybody says it and you just have to guess the true meaning from the circumstances. Rojo -- Not the red color, but the 1000 colones bill. Un rojo means something less than two dollars. Sidenote: Costa Rica has what’s probably the world’s most beautiful currency. Limón -- Nope, not the fruit. Well, actually, it is the fruit, but it’s also a region of Costa Rica: the Caribbean where the country’s Black populations are located. It’s also where most of the sloth animal sanctuaries are located. Cas -- It’s a really sour tropical fruit that’s sold just about everywhere. Costa Ricans will it eat with salt, or as a fresh fruit juice. When the weather is too hot, you can’t go wrong with an jugo de cas. Arreglado -- It translates as “fixed,” but in Costa Rica, it’s a small sandwich with beef, Lizano salsa, cheddar and lettuce with tomato. Lapa -- One of Costa Rica’s most iconic tropical birds, it’s the local name for the scarlet macaw. On the Pacific coast, there’s a popular spot along the highway between Jacó beach and Manuel Antonio where many can be spotted in the wild. Perezoso -- Our furry friends called sloths, of course. Soda -- A small restaurant located both in the big cities and the small villages where locals go and eat. Similar to a restaurant, but in those truly authentic places, you’ll find sodas located inside the garage of a house. Pulpe (or Pulpería) -- The small convenience stores located in every barrio (or neighborhood). They sell everything from toothbrushes to cerveza. Dengue -- The reason why you need to have insect repellent, especially in rural areas. This blog post originally appeared on Adam's gay travel blog, http://travelsofadam.com.